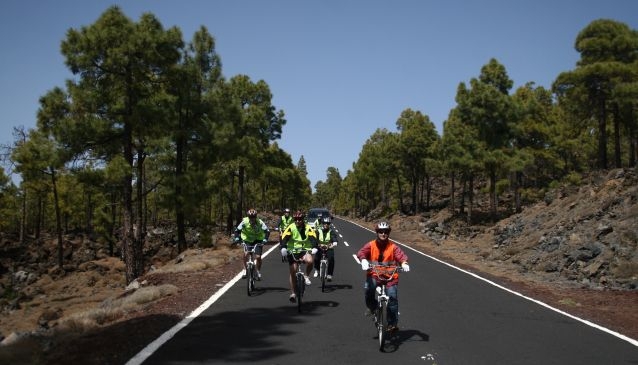 'It's all downhill from here' which is what you like to hear when you're riding a bike and that is exactly what Rafting Bikes in Tenerife is all about... 22 miles through some of the most spectacular scenery on the planet without pedalling! After picking you up from your hotel or apartment, you'll be transferred by mini-bus through the stunning Teide National Park up to a 2,200m (7,200ft) high plateau in the shadow of the volcano cone, the birthplace of Tenerife. From there you'll be allocated a bike along with the necessary safety accessories ie high visibility vest and helmet. After a few simple instructions from your accompanying guide you're on your way. But there's much more to this unique trip than just freewheeling back to the coast. You and your fellow travelling companions will experience that feeling of being at one with nature. Unlike a coach or car trip, Rafting Bikes gives you the opportunity to stop and pause and 'drink' in the views whilst socialising with like-minded people, many of whom perhaps like yourself, will not have ridden a bike since their youth. The following support vehicle provides picnic refreshments, as you descend at a leisurely pace on the roads through the pine-scented forest. Blue skies, the open road and a gentle breeze in your face... it's the only way to see Tenerife. Established since 1999, this a popular excursion and places are limited so to avoid disappointment we strongly recommend you book your trip in advance by clicking here or phone 00 34 611 490 677... tell them My Guide sent you and receive a 10% discount! For those who want to branch out on their own The Bike Man offers a comprehensive range of cycles for hire to suit all. Maybe you want to explore the resorts - there's a city bike waiting for you. As a keen cyclist you may want to venture further afield, so a top range road bike would be your choice. How about a bit of 'off-roading'? No problem! Children's bikes, baby chairs... the Bike Man has them all! All bikes and accessories are delivered to and collected from your hotel or apartment with no deposit required on one day rentals. Add a new dimension to your holiday and reserve a bike today by clicking here or phone 00 34 611 490 677... tell them My Guide sent you and receive a 10% discount. The Freebird Catamaran is a high quality boat excursion rated one of the best boat trips in Tenerife. Exploring Tenerife doesn't get much more original than diving to the bottom of the Atlantic Ocean on board a state-of-the-art submarine! Get ready to enjoy a privileged place for diving, with tropical temperatures all year round, as well as fantastic visibility: Radazul is THE perfect place for you! Located in the premier resort of Playa del Duque, the bijou El Mirador Shopping Centre offers a unique shopping experience for the discerning traveller. Get ready to rumble! Discover Tenerife on the back of a Harley Davidson motorbike... one of the most unique and exhilarating ways to see explore the island!